The sought after Cromodora and Campagnolo wheels are a thing of beauty and a desired feature to a classic Dino. 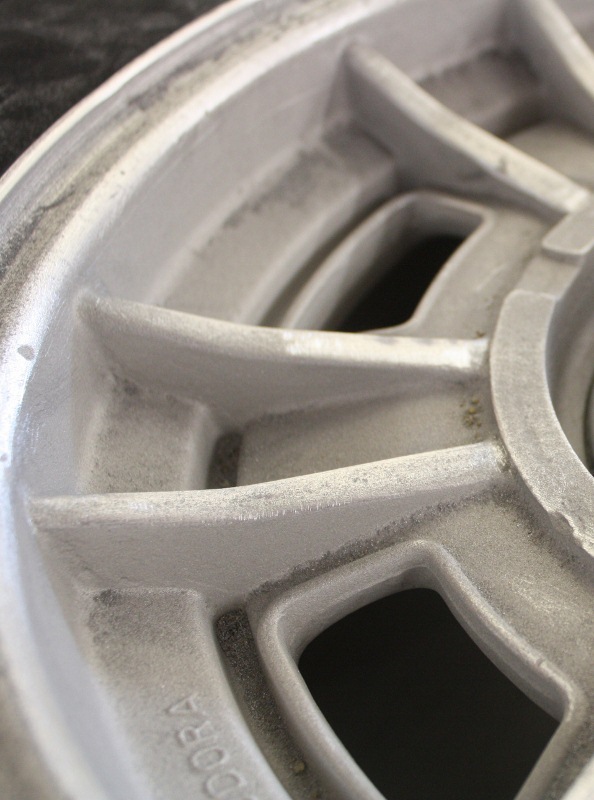 These older, light-weight performance wheels are magnesium and aluminum alloyed mixed material. They are not 100% magnesium. Because of their makeup, coating or painting them require a very special process. As you begin the process it’s very important that you’re working in a clean environment for the stripping process of the old paint. I prefer NOT to use any liquid stripping products. It will lead to contamination and will incubate first stage corrosion. Blast stripping with a clean media is key. Using walnut-shell or plastic media to strip existing paint is safe and fast, and cost-effective. NEVER SOTA BLAST THESE TYPE OF WHEELS! 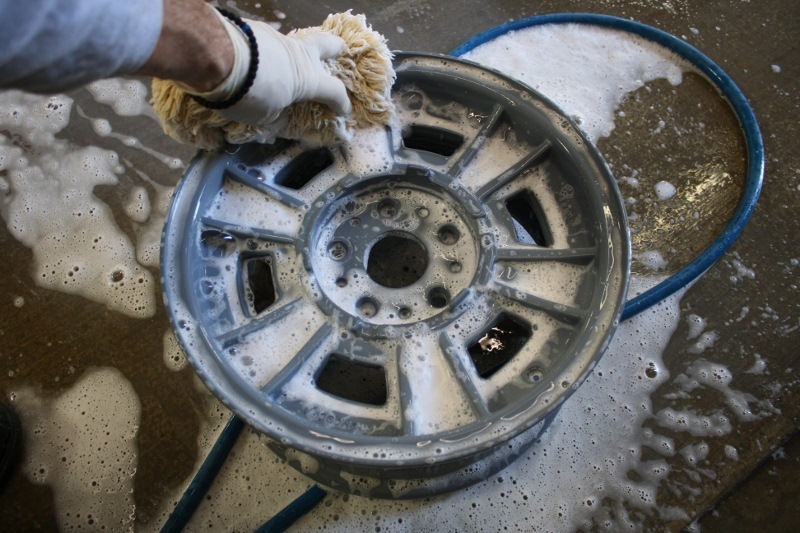 Before you send your wheels to the blaster, clean thoroughly, degreased, scrubbed and ScotchBrite, pressure washed or, better yet, steam cleaned to eliminate all the grime. If the cleaning of the wheels isn’t done before the Blaster does his job it gives a greater chance of contamination to imbed in the pores of the metal as it mixes in with the media while blasting. It’s very important to have clean media and have clean wheels to start! A good blaster will not lose any print and will not damage wheel edges by this type of media blasting method (walnut, plastic, or non-agressive media). After you get the wheels back from the Blaster handle with care, use gloves and keep your oily mitts off them. At this time repair any nicks or scratches in the metal as needed by hand filing or by using a small drummel tool. 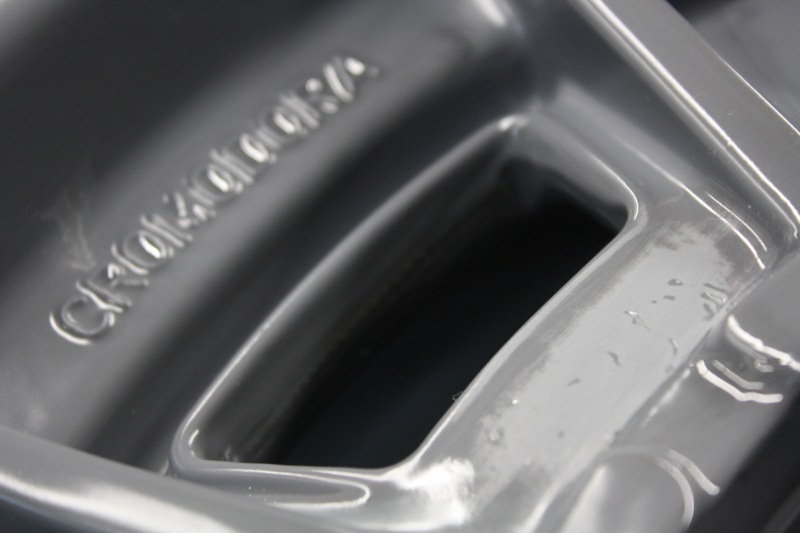 After this step, it is paramount that you thoroughly Alodine® wash and then rinse the wheels. Alodine® wash is a prep / adhesion promoter to use before your first primer. Alodine is used in the aircraft industry to prep any aluminum or magnesium that has to be painted. It is a protectant against corrosion and acts as an adhesion promoter as well. THIS IS A CRITICAL STEP! Once the wheels are thoroughly rinsed put them in the sun and let dry naturally or, ideally, put them in a heated spray booth or oven and bake them at low heat for one hour just to make sure all the moisture is gone. I don’t recommend blowing the wheels with compresed air, but if you are certain your air source is clean you may blow them off to dry. The wheels are porous but now you can begin building materials that will fill the pores. 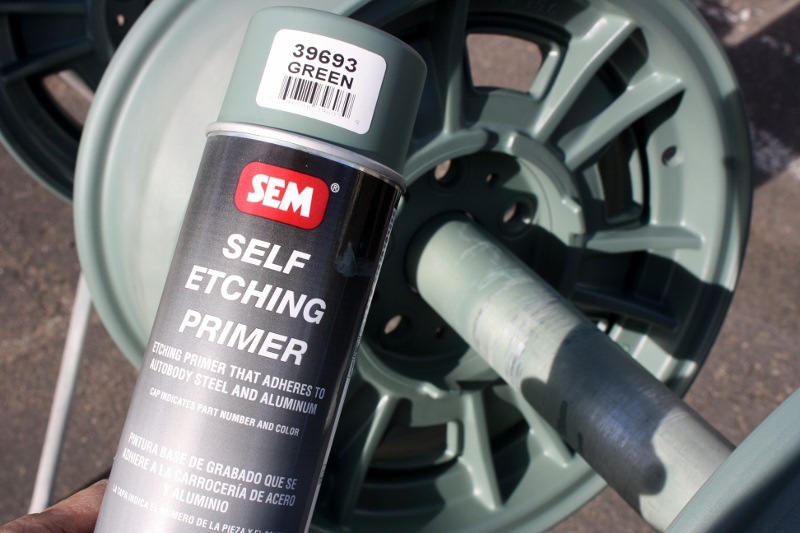 Next, use a self etching primer – NOT A ZINC CHROMATE PRIMER! After coating with a quality self-etching primer let the wheels dry naturally again for 24 hours – or you could bake at low heat for one hour. The next step is to lightly nib sand the self-etching primer and fill any remaining nicks or chips with a two-part polyester body filler. Sand your putty spots and blow off the dust then tack off the wheels. Then apply two or three wet coats of a high quality epoxy 2k primer. This will fill and flow smoothly over your first initial etching primer. 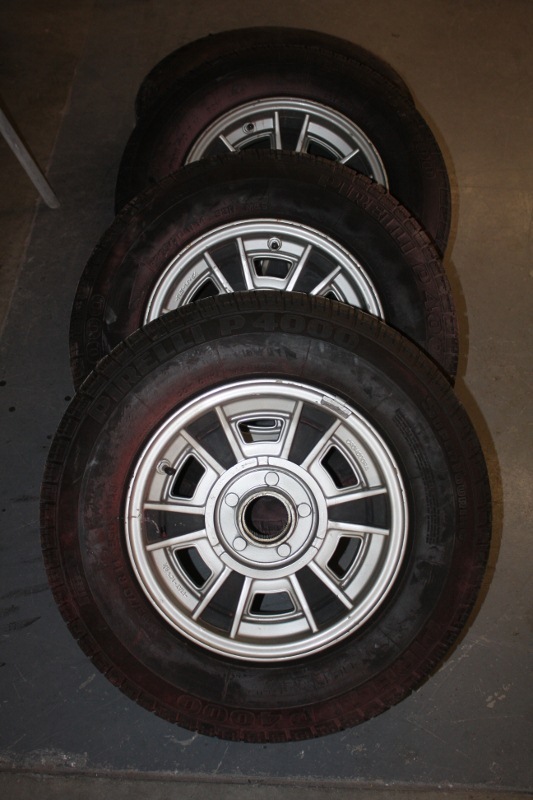 After this spraying process is finished, bake the wheels for one hour if possible, then let air dry for a minimum of 72 hours. This will ensure that your primer is cured. 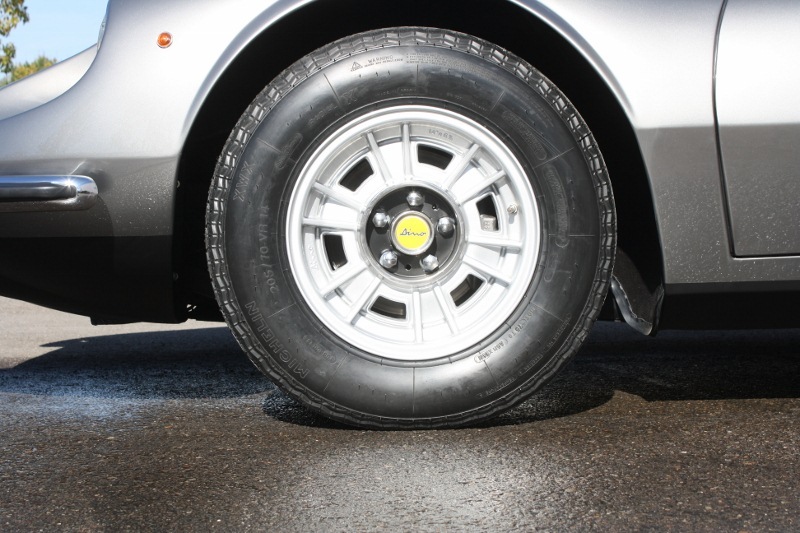 After the primer has dried hard, mount your tires but do not inflate. Mask off the tire and prep for paint. I like to mount the tires before paint because most tires, especially the Michelin XWXs, have such a hard side wall. It reduces the risk of damage when they slide the tire over the edge of the rim in the mounting process. Here’s the wheel after epoxy primer. Small imperfections will sand out in 600 grit wet. Pores have been filled with primer. 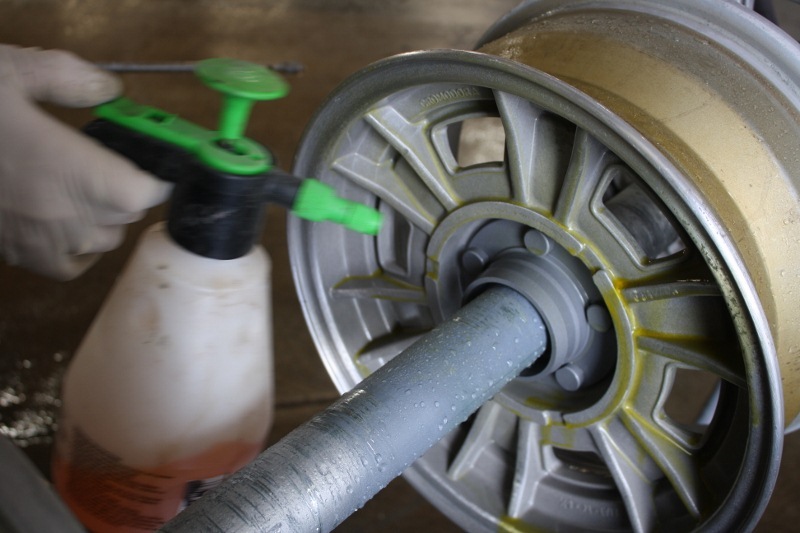 Lastly, base coat and clear coat the wheels with a water-based or solvent base coat and apply a high quality urethane automotive clear. 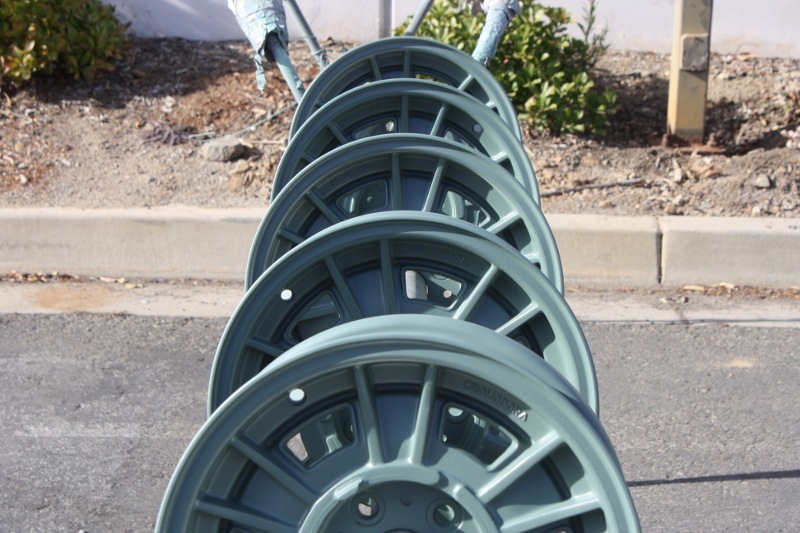 If done correctly, you will end up with a set of painted wheels that will look spectacular and last a very long time. One more tip for your painter… if he can spin the wheels and tires, or roll them on top of a table while he’s spraying them, this will help him do a thorough spray job in all the nooks and cranies. It may sound like a lot of work but you won’t have to do them over unless you hit a curb. Call me with any questions at 949-922-3013. Those look absolutely amazing! I’m thinking of powder coating mine! 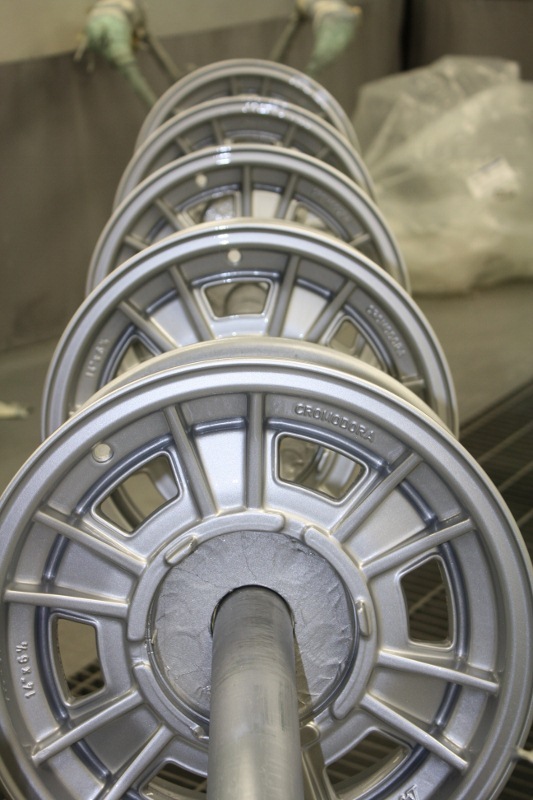 Powder coating is fine if your wheels are in perfect shape with no dings or nicks in them. If you fill these dings and nicks with filler and then send them to the powdercoater the heat will bubble the filler. 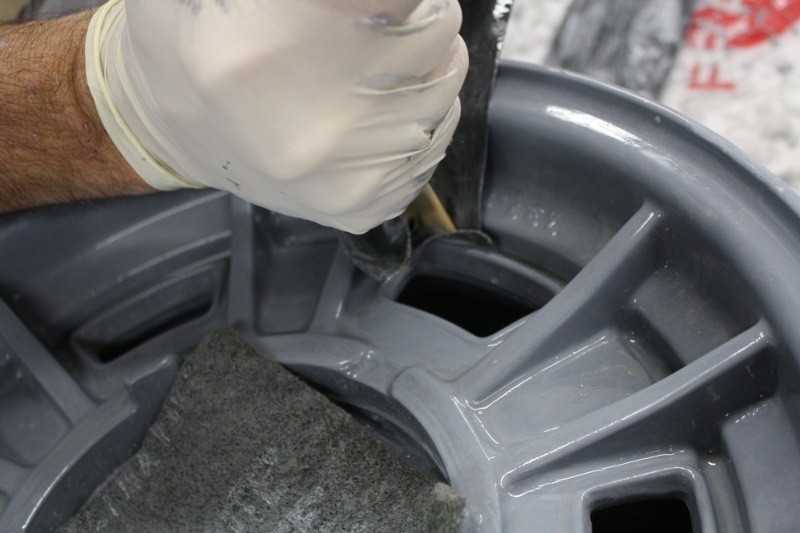 If your wheels need repair in any way it’s much better to coat them wet. The paints and clears now a days are very durable. 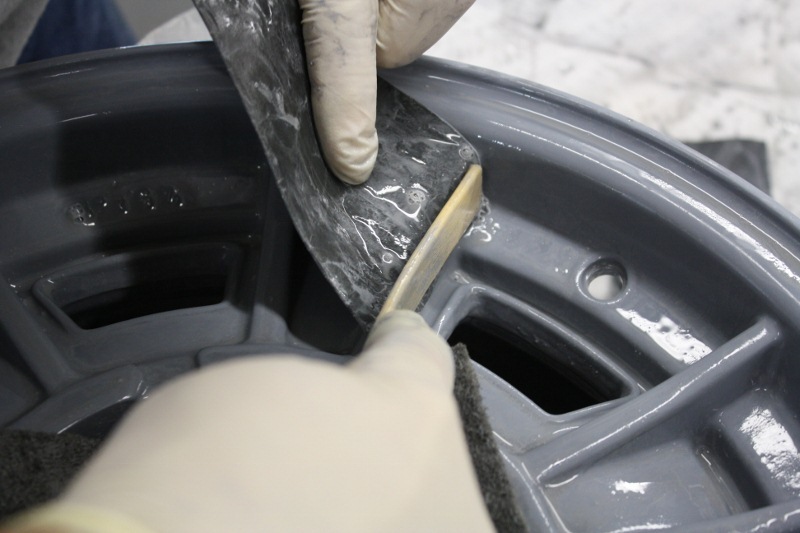 Another tip: all your prep on your wheels can be done with the tires off – including primer. But before you paint them mount the tire just don’t air them up, mask off the rubber, base coat and clear coat the wheels, pull the paper off the tires and air them up. I have Halibrand Cobra II wheels. They have a machined finish rim. Can I clear coat them? Hi Mike, I don’t recall if I ever got back with you on this. I apologize. It’s tricky. A machine finish is probably the hardest one to coat and have it stick correctly. 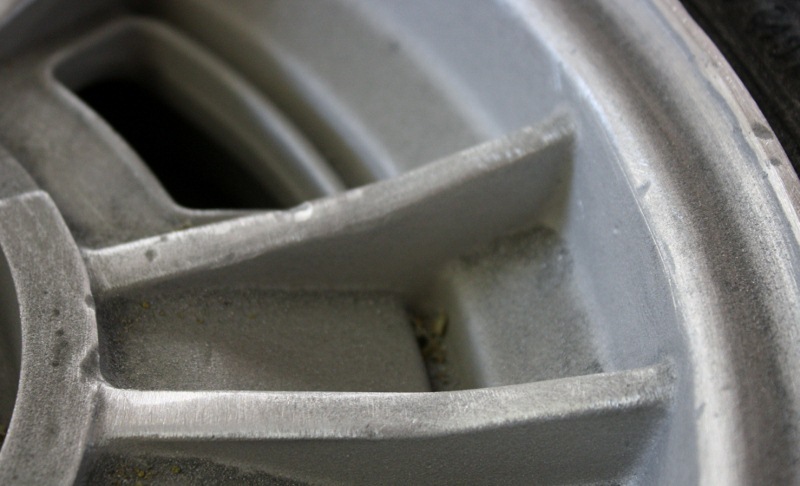 There are a few things you can do to help the adhesion to a machine finished wheel. Let me know if you’re still needing to finish them. Hi Steve, I have just resored a set of cromodoras for a Fulvia and after 2 months I started getting small veins and bubbles in the paint. I remeber the sprayer saying that he soda blasted the wheels and washed them several times before prepping. Can you please help me out??? Hi Steve, Is this your direct line or mobile number please, as I will be calling from Malta. Thanks again. Manuel, or my email is: skouracos@live.com. 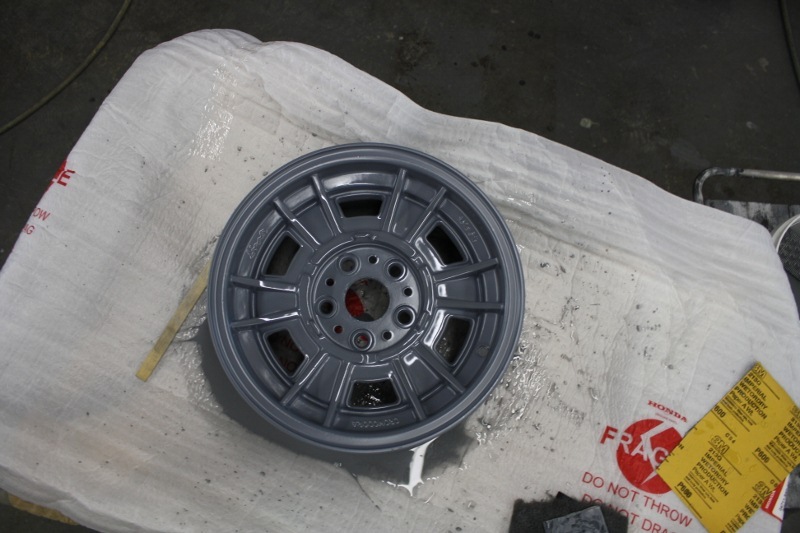 I have several set of Ferrari wheels to be painted. Does anyone know of a good shop that does these correctly. Also why not zinc chromate. I was told this was a must by an aircraft painter for anything with magnesium in it??? 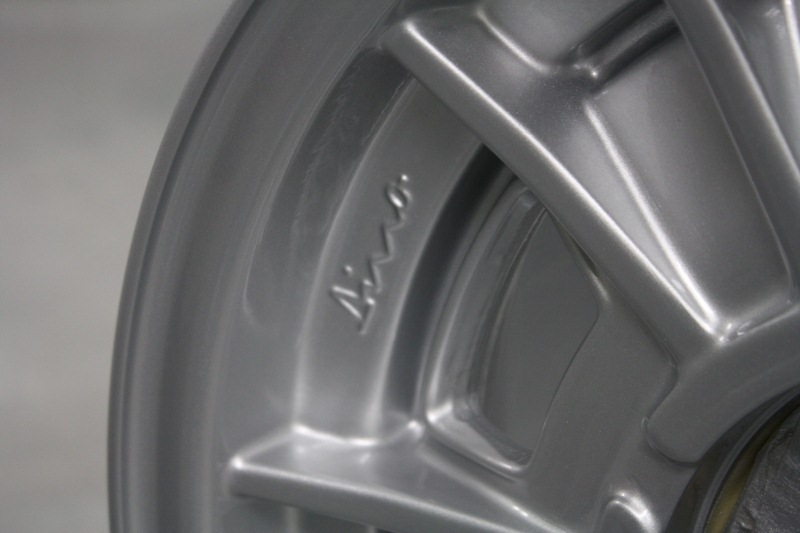 Thanks for your inquiry about the Ferrari wheels and zinc chromate. I’m sorry it’s taken me a bit of time but I’ve been knee deep in work. As for zinc chromate…zinc is not necessary and a lot of base coats don’t stick very well to zinc. But a chromate primer works well. It’s the chromate that you need for adhesion and anti-corrosion, not zinc. Regarding your Ferrari wheels, I do wheels. Please feel free to contact me by phone at 949-922-3013. I read the above-mentionned restoration tips with great interest. I was wondering whether you could provide further clarifications as to Alodine. Based on my research, there are several types of Alodine products, i.e. 1000, 1024, 1200, etc. Do you recommend any specific Alodine products, and if so, which one and why? I will confirm with you later in the week. I believe it is the 1000 but I will double check when I get to the shop tomorrow. The reason WHY…. is that this product Cleans & Preps the surface to provide a invisible clear corrosion barrier as well as a adhesion promoter between your surface and primer with no mill thickness. I have a set of compagnolo magnesium alloys size 13×5. What’s it cost to have them refurbished? Dino, The process for paint runs about $350.00 per wheel… depending on condition. Xraying for cracks and stripping is additional. Steve, Thank for your inquiry Steve..unfortunately I do not do dow 7 . But I hope I can steer you the right way.